As an introvert, I thrive on routine, but even reserved-types like me enjoy something fun and special every once in a while. 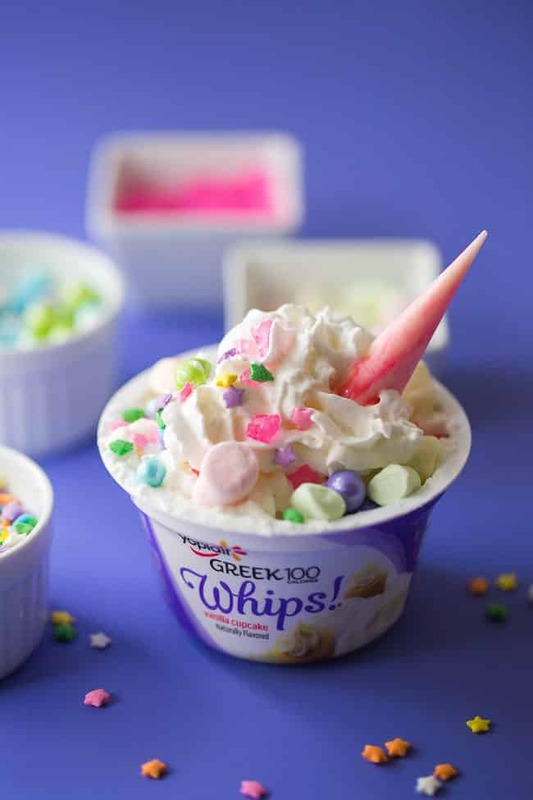 What’s more fun, special and downright magical than a unicorn yogurt bowl? Now, don’t all of you giggle at me at once! I have to admit something, y’all… I’m totally on board with this unicorn trend. It brings out the 11-year-old in me—the girl who had a Lisa Frank trapper keeper and neon-everything. 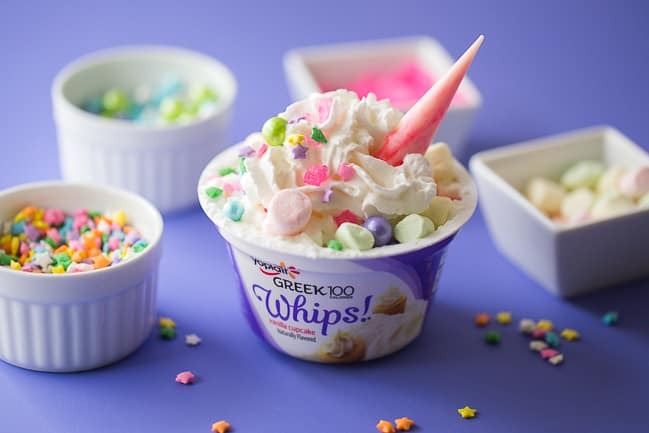 Now, I’m not prepared to commit to unicorn hair or even glittery nail polish, but I’m in my happy place when I dress-up my container of Yoplait Greek 100 Whips! Vanilla Cupcake yogurt with whipped cream, marshmallows, sprinkles and a white chocolate UNICORN HORN. 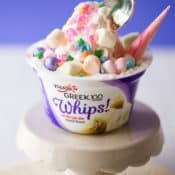 I’m basically already obsessed with Yoplait Greek 100 Whips! The Whips! texture is so unique. 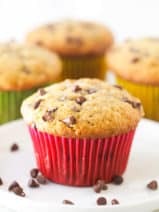 It’s light, fluffy and scrumptious. 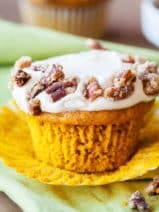 The Vanilla Cupcake flavor is my favorite, and has only 100 calories per container. Believe it or not, you don’t have to go over-the-top with your unicorn yogurt bowl toppings to get a pretty effect. A touch of whipped cream and some sprinkles will get the job done, but if you want to make that crazy-cool unicorn horn it’s actually really easy and I explain it in the recipe directions below. I have to give props to my pal Lindsay who came up with this unicorn horn hack! Like most working moms, my schedule is pretty full. 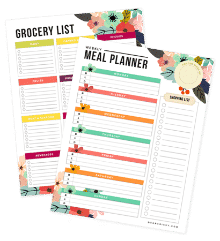 I spend a lot of time caring for my kids, my husband, our pets (pretty much everyone but myself) and rushing from appointment to appointment. Any time I can enjoy a Greek 100 Whips! 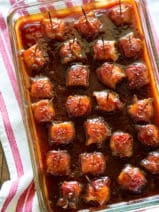 as an afternoon snack is a good day, but why not give that delicious snack a super fun makeover? Make even the most mundane day magical with this easy and delicious unicorn yogurt bowl! Create a 2″ cone using a small piece of waxed paper and piece of tape. Melt a few candy melts in the microwave for about 30 seconds. Stir in 1-2 drops of pink food color (gel works well). For a marbled effect, don’t over stir. Using a spoon, gently pour your melted candy into the cone to coat the inside. 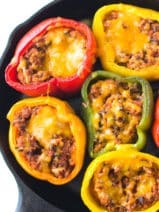 Put it in the refrigerator to harden while you finish your bowl. 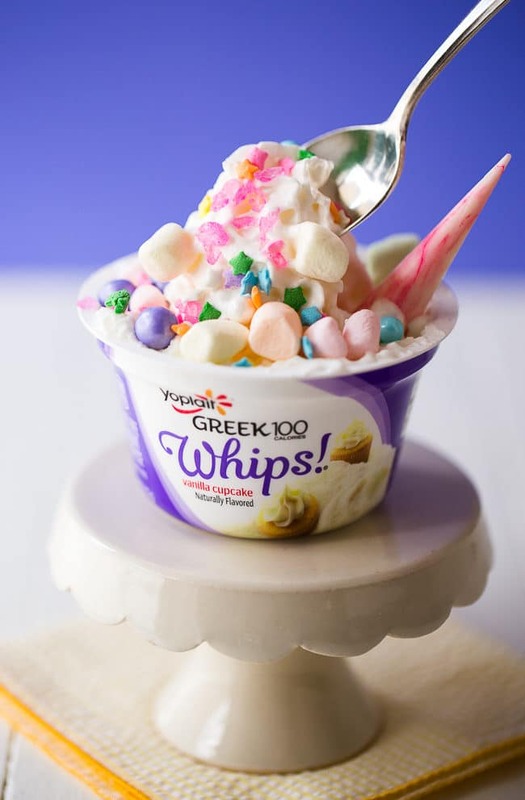 Pop open a container of Yoplait Greek 100 Whips! Vanilla Cupcake yogurt and add a bit of whipped cream. Top with your favorite colorful sprinkles and mini marshmallows. Remove your unicorn horn from the refrigerator and remove tape and waxed paper. 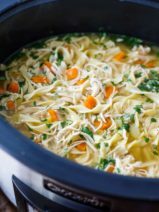 Insert your magical unicorn horn into your bowl and enjoy! 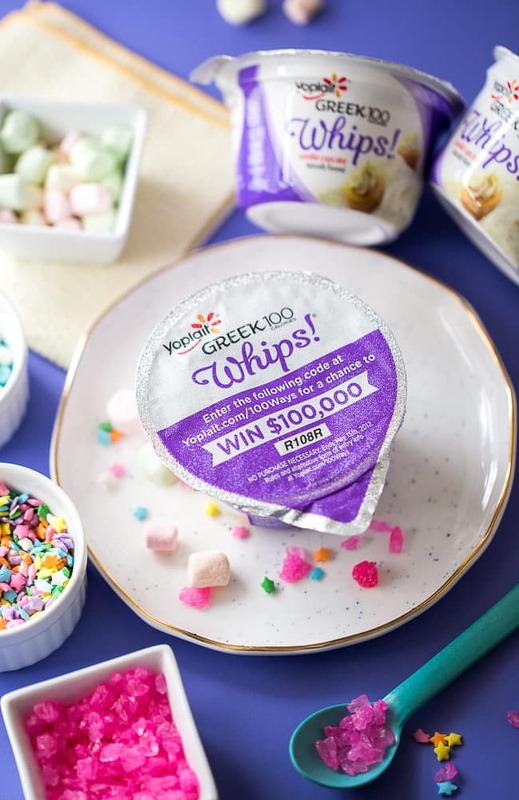 Yoplait is inviting you all to try all 100+ flavors for a chance to win $100,000! Simply enter the code on top of specially marked lids at Yoplait.com/100Ways and you could win one of more than 3,000 prizes*. You can find a full list of all of the Yoplait flavors at Yoplait.com/products. *NO PURCHASE NECESSARY. Ends 5/15/17. To play and find Official Rules, visit Yoplait.com/100ways.